Products with lemon essence definitely make me go crazy. 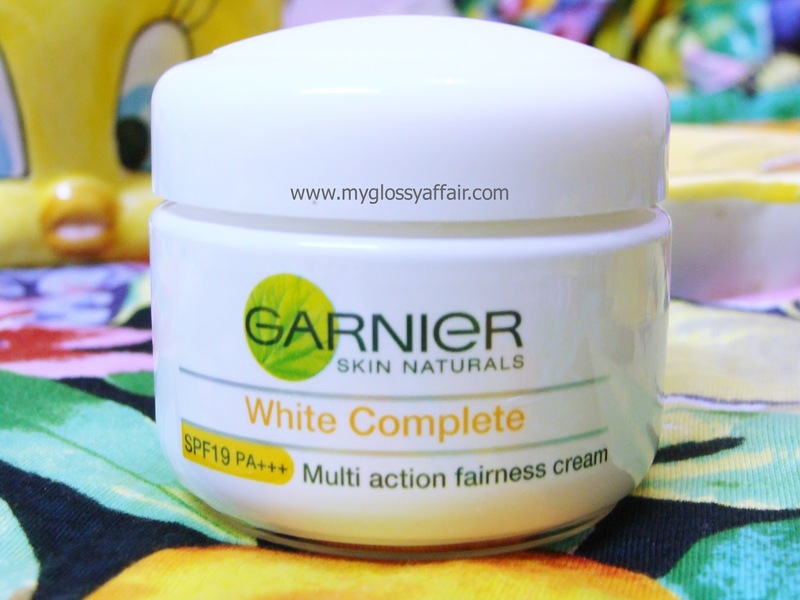 Though I am not particularly a fan of whitening creams and face washes yet “Garnier Skin Naturals White Complete Multi Action Fairness Cream and Face Wash” caught my eye and I thought of giving these a try. I have been using both the products for over a week and as claimed by the brand, you will see the difference in your skin within 7 days. I was more excited as I was going to try a cream and face wash duo for the first time as it sounded promising to me. Garnier uses wherever possible, active natural ingredients which have been carefully extracted to preserve their quality and purity. Products have been dermatologically tested to ensure respect to your skin. Multi Action Fairness Cream: A fairness cream that not only provides instant whitening but also makes you 2 tones fairer in 2 weeks along with sun protection. With unique formula that combines revolutionary active white for instant whitening and flawless fair skin. The only cream that gives 10 benefits for complete fairness including instant whitening, sun protection and lasting fairness. Garnier White Complete is suitable for all skin types and with regular usage it makes skin feel fresh and moisturised with a healthy glow. Pure lemon essence clarify and smoothen skin and SPF17/PA++ to protect skin from further darkening by harmful UVA and UVB rays. Instant whitening : Provides instant whitening. Sun protection : protects skin from further darkening by harmful UVA and UVB sun rays. Lasting fairness : makes you two tones fairer in 2 weeks. Apply daily morning on perfect cleansed skin. Gently massage into skin using light circular movements, moving from center to face outwards and from the base of the neck to the top. Do not apply to the delicate eye contour area or on irritated skin. Active ingredients in Garnier Light Pure lemon essence and Vitamin C to clarify and smoothen skin. Long dan extract to help slow down skin darkening. Glycerin to moisturize and comfort the skin. Enriched with exfoliating pure lemon essence, its formula cleanses, clarifies the skin thoroughly and removes impurities that make skin dull. Aqua / water, Palmitic acid, Myristic acid, Lauric acid, Potassium hydroxide, Stearic acid, Peg-7 glyceryl cocoate, Sodium cocoamphoacetate, Disodium laureth sulfosuccinate, Peg-150 Distearate, Glycerin, Ascorbyl glucoside. Alcohol, Dmdm hydantoin, Limonene, Linalool, Benzyl salcylate, Gentiana lutea / gentiana lutea extract, Propylparaben, Disodium edta, Butylparaben, Cetyl hydroxyethycellulose, Citrus limonum / lemon fruit extract, Bht, Parfum / fragrance, Sodium chloride. With moist hands, work a small amount of product into a lather and apply to face. – Gently massage onto moist skin with fingertips. Rinse thoroughly – For best results, follow with Garnier Light daily moisturizer. My skin being super oily, I stay away from day creams and prefer aloe vera gel or matt sunscreen instead. But since the face wash is good enough for my oily skin and these products are meant to be used together, I gave this cream a try. As per claims, it instantly brightens up the face and makes one look a bit fairer. Sun protection is an added advantage. But after 5 mins or so, I found that this cream becomes little sticky on my face. Don’t blame it, in this humidity, nothing goes on me. None at all. But the good part is that, it doesn’t cause any breakouts even in this hot and humid weather. So, I am sure, I will be able to use this in winters. I gave this cream to my cousin too to use who has normal skin with oily T-zone and it suited her perfectly. Yes for instant fairness and brightened skin. But really, I can’t comment on long term fairness as I don’t believe in any such thing 🙂. Instantly it cleans and brightens the complexion, that is sufficient for me 🙂. I liked the face wash as it is perfect for my oily skin and it doesn’t cause any breakouts even in this super humid Delhi weather. My skin feels thoroughly clean and fresh after using it. I loved the mild fragrance too. Instantly it really makes the skin fairer but as it has only been a week I am not sure about the long term results. But in this week, I have seen some brightening effects and a cleaner skin. It doesn’t cause me any breakouts. It doesn’t lather too much but spreads well, cleanses well and washes off easily. It doesn’t leave any sticky feeling to the skin and also, doesn’t dry out the skin. I would surely recommend the face wash to all my beauties and guys too who look for instant brightness and fairness in skin tone, all skin types. You are gonna love it. If you want to achieve better results and want sun protection too then I would recommend you to go for the combo – Facewash + Cream. You will get better results and skin will be moisturized too. Boon for dry and normal/ combination skin types. Good for oilies too but leave the very hot and humid months. The cream is good for normal/dry skin. Agree with you on all points. Great review! this sounds like a useful product, of late I'm facing problem of pigmentation around mouth so I have a new appreciation for fairness products! Am already light skin so i stay away from whitening poducts. Fab details! This sounds like an interesting product. I've tried their eye roll on and mask as well. Quite good to say. We have the wash and cream here too. Must try after reading your post. Wow I would love to try them as samples first . The face wash sounds nice to be. I too have oily skin. Even I'm loving facewash more..